Charise Creates: Sew Mama Sew Give-Away Day!!! Hi! Today is the first day of Sew Mama Sew's Give Away Day! Please leave a comment on this post by December 7 at 5 p.m. PST. AND don't forget to check out Sew Mama Sew blog for more give aways!!! Your patterns are amazing! Thanks so much! I am so in love with all your patterns!!! What a great giveaway!!! Thank you so much. Oh so lovely! I would love to own and sew those! Thanks so much! These are so cute. Looks like lots of fun to make too! Thank you!! I love the patterns. Hope to win! I love your patterns :-) Thank you for the giveaway! Oh I just love them,especially the apron. Thank you for this chance. Oh. my gosh! I hope I win, I love your patterns! What an awesome prize! Hope I win! Fabulous giveaway! Gives us a chance to really try your patterns! Such a terrific giveaway! You have created really great patterns! 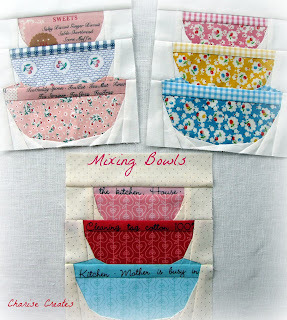 Just spent my morning in the kitchen suing my apron and mixing bowls, sounds like it is time for a cup of tea! Very cute! I would love to make them! Super cute! Thank you for the chance to win these adorable patterns. Oh I love your patterns! Thanks for a chance to win and make these! They are gorgeous! I'd make them up into a wall hanging. thank you, those are amazing! I'm planing to buy these patterns, so I hope that I could win them!! I don't need to say that I admire all your patterns! What fun patterns Charise and a great giveaway! Yay! Great giveaway :) Thanks for the chance! I love all of your patterns, Charise. I think that apron may be my all time favorite! Love these patterns! So cute! These are so adorable, Charise. Thank you so much for the giveaway! Love your patterns. Thank you for sharing. I would be excited to win them.....grin. Oh, I so so want to win those, they are absolutely adorable! Your patterns are delightful! Would love to be the winner! Please pick me because I love these. The solid color bowls remind me of the Pyrex mixing bowls of my childhood! These are just too cute! Thanks for the chance to win the patterns! Your patterns are so cute - love them! The bowls (and everything else) are just adorable! These are super cute! I've never done paper piecing, but sure would love to try it! Thanks for the chance to win! i love paper piecing. I think i just put this in my cart to remember them on Craftsy. Oh how I love paper piecing! These patterns are so cute! Thanks for a chance! Oh my, I would be SOOOOO excited to have some of your patterns! They are truly amazing! Oh wow....I would so love to win! Thanks for the chance! I love paper piecing, and these are amazing patterns. Thanks! I love those patterns and love paper-piecing. A match made in heaven. :) Thanks for the give-away. These are such cute patterns. Thanks for the chance to win! Too too cute!!!!! thanks for the giveaway! Your patterns are adorable. Thank you for a great giveaway. I love your paper piecing patterns especially the teapot. Would make a great Christmas gift! 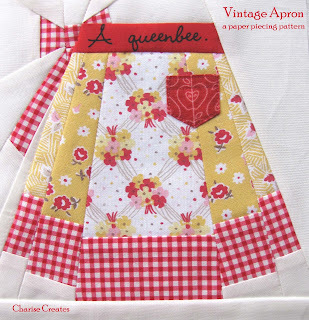 I love paper piecing patterns - for our Paper Piecing Wombat Stew Bee I am queen bee next and will be asking for teapots! I love the patterns, fingers are crossed! LOVE your patterns! Thanks for the absolutely wonderful giveaway! Blessings! So cute! I have just learned paper piecing - those look like great fun! Love foundation paper piecing. Thanks for the chance to win. Thank you so much Charise for a chance at the give-away! Your patterns are fabulous! I love paper piecing & plan on doing "Two Dresses" in the new year. lLove your work. thanks for sharing. I haven't done a lot of paper piecing but I have been following you for a while - nearly local too. OMG! I would LOVE to win this. I've been smitten with this line for awhile now. Thanks for the opportunity! I love all of your designs! Thanks for the chance to win some of them! Hi, from Long Beach, CA. Can you believe I have never made a quilt or done any piecework?! But I love following your blog with the hopes that as soon as my office/craft room is done, I will be able to start "learning" on my own. I love fabric just because...the chevron fabric is beautiful!! I love paper piecing and have all of your stuff on my someday list. I would love to win these! Thanks for the lovely give away. I love paper piecing and would love to win. I really love that apron. Hello from Minnesota. I have seen you lovely patterns all over the Pinterest/Flickr-sphere; I am so ready to win this!!! Adorable patterns and fabric!!! I just learned paperpiecing and love it! Those patterns are simply adorable! Thanks! How cute they are! I would love to make them. I'm just starting to learn paper piecing and really love your patterns! Oh wow I love these patterns. such a nice prize. thank you for a chance to win. I have enjoyed your designs for sometime now. You have some amazing designs. I love the Tea Time and Vintage Apron! Thanks for the lovely giveaway! Such a lovely set of pattern! Wow -- how generous! I would be thrilled to win even one of your beautiful patterns! I'm working up the nerve to take the plunge into paper piecing today, actually. I have an idea for an advent themed table runner for the console table where my nativity figures are displayed, dark blues with a paper pieced (hopefully!) star in the center, where the little manger goes, and maybe stars on the ends, hanging off the table, with four Advent candles appliqued around those stars. Maybe after paper piecing a few stars, I'll have the courage to attempt one of your intricate patterns! These patterns are really cute! Love them! Great patterns! I love the bowls! I love all of your designs Charise, they are so clever, sweet and well, just perfect. Thanks for sharing! these are wonderful. i love them all. thanks for sharing. well aren't those just the sweetest things...so cute. I hope I get to win! These patterns are amazing - thank you for a chance to win. I love these patterns! They are pure perfection! Thanks for the chance to win! Oh these are cute! Perfect for a kitchen wall hanging! Thanks for the chance to win! Those are so cute! I haven't yet paper pieced, but I plan to learn this year, so I'd love these -- thanks! I'm swooning over your patterns. They are delicious! These are delightful! Thanks so much for participating in Giveaway Day! Those patterns are amazing - I had no idea you could do that with paper piecing. Love the apron most I think. What a wonderful opportunity love your patterns! 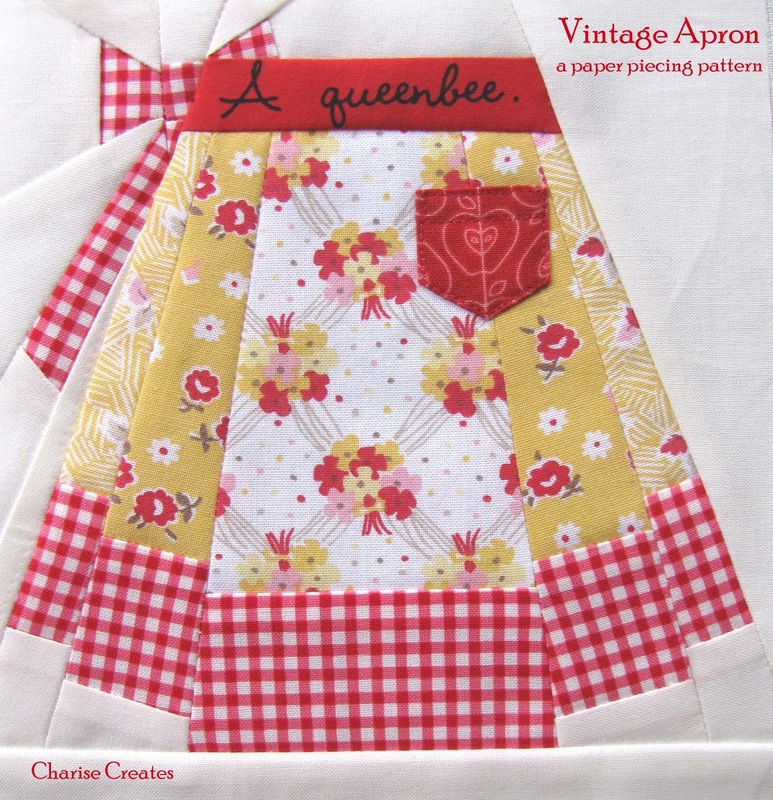 I have admired your apron pattern piece for ages; I think I've even pinned it on Pinterest! I really want to earn how to paper piece. Your patterns are gorgeous! Your patterns are so original! Thanks for the giveaway! Fabulous giveaway! Thanks for the opportunity to win one of your lovely paper piecing patterns!! Love all your paper piecing patterns! I have just learned to paper piece and I love, love, love your patterns. I am so glad I stopped by and I am now following your blog by GFC and email. linens. These patterns would be perfect! I am a happy follower by e-mail & GFC. Thanks for the chance to win! I love paper piecing and your patterns are just gorgeous! I love your patterns! I've always enjoyed the process of paper piecing and can't wait to try these. Thanks for the chance. Your patterns are beautiful! Thanks for the chance to win! Cute patterns, I love the teapot the best. LOVE! Thanks for the great giveaway! These are just fabulous!! So much fun to make! I'm in love with your patterns, congratulations! Thanks for the giveaway! Those are so cute I love the Apron. 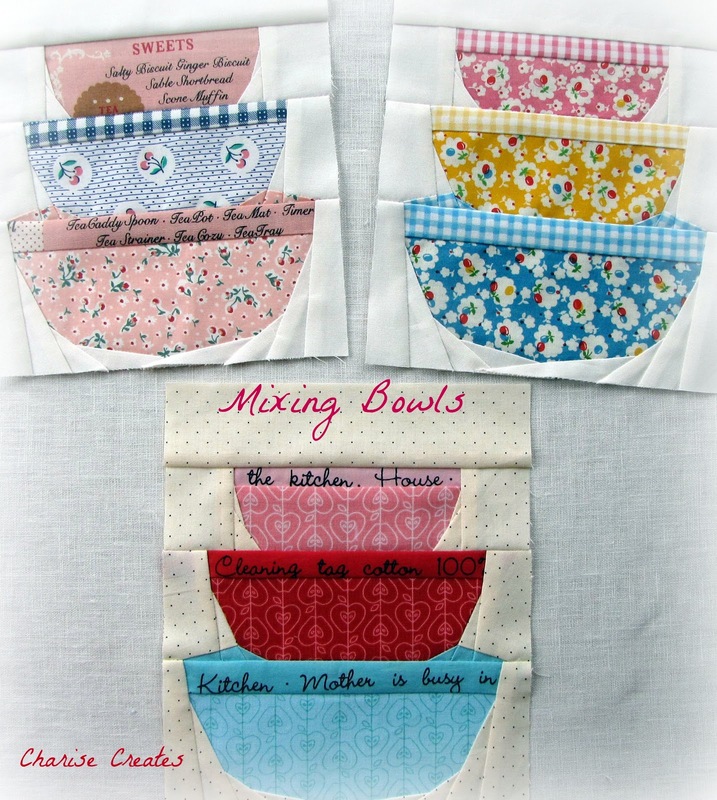 Ooh, I'm in a paper piecing bee and one month is vintage kitchen - those bowls would be perfect! Those patterns are gorgeous. They make me want to give paper piecing a try. Love, Love, Love these patterns. Thanks for the chance to win. I've never tried paper piecing before but it fascinates me. I love to cook so this would be the pattern set to try - thanks for the chance at these charming patterns! Your patterns look like so much fun! Thanks for the chance to win. I am a new quilter and really want to try paper piecing. Your patterns are soooo beautiful! Love them all! These are such cute patterns and I love paper piecing. Thanks for the chance! I love your patterns and your blog. Thanks for adding e-mail subscription as I am always sure to read anything that comes right into my Inbox. Keep up the great work! I just found your blog through Very Kerry Berry and love it (I subscribed to it on my google reader!)! You make the cutest designs and would love to win ~ thanks for the chance! Adorable!!! Thanks for a great giveaway~! LOVE these patterns! Thanks for the chance! Love your patterns. Thanks for a chance to win. Great patterns. Thanks for the opportunity on the draw. Merry Christmas to you. What a cute apron block! 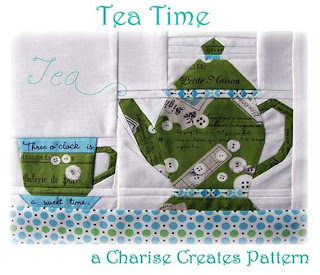 I love your tea time pattern! I've never tried paper piecing, but I'm sure I could learn! Thanks for sharing. I really want to learn paper piecing..your patterns would be a great start! Thanks. Such a fantastic prize package...all my favorites!!! Merry Christmas! These are some of my favorite paper piecing patterns thanks for the chance to win. Adorable! So glad I found your site - I love foundation piecing! Thanks for the opportunity! Love your patterns! The apron is to die for! Thanks for sharing your talent. Your patterns are amazing. I love your pieces! Absolutely adorable!! Love your prizes! Thanks for the chance to win! That Vintage Apron is fantastic ! Thanks for the chance. I have never tried paper piercing before but your teapot and cup makes me want to try it! Especially as I have a friend obsessed with tea! Fantastic prizes, thanks for the chance to win! I have been a follower for quite some time and I love ALL your patterns. You are a very talented pattern maker! Paper piecing used to be my go-to technique. Then I moved onto another venue. But YOU and YOUR patterns have lasso'ed me back, and I thank you! I love your fresh and whimsical pieces - they make me happy and inspir eme. Thank you for this opportunity to win! I love your patterns! It makes me want to get serious about trying paper-piecing. Great patterns! I especially like the Tea Time one. :-) Thanks for the chance to win them! Very sweet patterns!! I've never done paper piecing. Thanks for the chance. All three are really nice but the apron is amazingly beautiful!